I recently watched the last episode of the Great American Reads special on PBS (https://www.pbs.org/the-great-american-read/results/). It recapped the top 100 books as chosen by Americans. Many of these books shaped my passion to become a writer and rekindled my desire to become a more avid reader. Number one on the list was To Kill a Mockingbird, one of my all-time favorite novels. My Australian Shepherd, Atticus, is named after on the of the novel’s main characters, the attorney Atticus Finch. This book resonates with me on so many levels. I remember reading it in school and empathizing with the characters. I read it again a few years ago and it still struck the same chord due to both its timeless and timely social issues. Many of the books that shaped my vision of women and writing appeared on the list including Little Women, Jane Eyre and my favorite Anne of Green Gables. On a summer vacation, my family stopped in Prince Edward Island where we toured the house that L.M. Montgomery based Green Gables on. My father, who encouraged my reading, bought me the full set of books. I still have those books though they are threadworn and the spines are torn. On that same trip, we toured Louisa May Alcott’s home outside of Boston, and I dreamed of being Jo in Little Women. The determined, adventurous writer. Another favorite that made the list was Pride and Prejudice. I discovered Austen after I made my way out of the juvenile library into the adult section, and this book remains my favorite of hers. I cannot say anything about her observation of social mores that hasn’t already been said but I can say Elizabeth Bennett is my favorite heroine, second only to Emma. For our eighth grade English class, I remember having to break down the parts of the novel and I chose this one. It continues to be my favorite and I routinely watch the BBC version with Colin First every time I fly from Greenville, South Carolina, to California. And Then There was None, the Agatha Christie novel that has been credited with starting the cozy mystery genre. In middle school, I read my way through Christie, marveling at her plot devices and decided I wanted to write mysteries. Naturally, after reading Nancy Drew earlier, Christie struck a chord with me. I have a biography about her sitting on my to-be-read shelf. There are other novels on the list that I haven’t ventured to read including A Tree Grows in Brooklyn, A Confederacy of Dunces and the Game of Throne series. I’m hoping I can find my time to make it through the list but my to-be-read pile has been growing over the past few months with books that are not on the list. In fact, I now have five shelves filled with books that I haven’t read but plan to make my way through. What’s on your to-be-read list? Did you watch the Great American Reads? What are your thoughts on the selections? Thanks for letting me stop by. It was fun to share my reading thoughts with you. 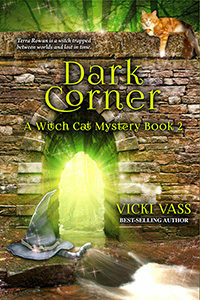 Thank you for being part of the book tour for “Dark Corner” by Vicki Vass. 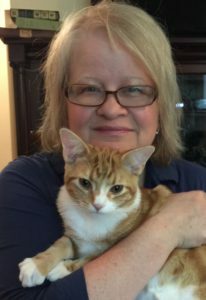 Enjoyed reading the guest post. Can’t wait for the opportunity to read the book.